We’ve all heard that expression – at least here at B’s Wine Bar – and nothing says good mood then a smooth and enjoyable experience from beginning to end. With that in mind, we are launching our new ONLINE RESERVATION system for beta testing on our website. At this moment, we ONLY will test the system for advance reservations for our Friday and Saturday Events nights – when we have a featured performer or band on hand from 8:30pm until closing. 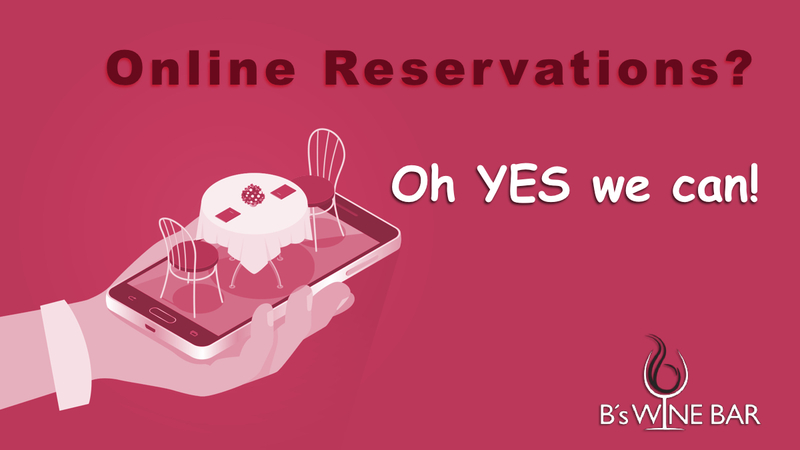 Reservations can be made up to 1 week in advance and space is not guaranteed if you use this system as we are currently putting it out for testing so we can iron out and fix any bugs that may happen – I know how sensitive some of us get with our reservations, so at the risk of repeating ourselves, the reservation system is up for testing now. Give it a try and give us some feedback on your experience. Your reservation is not confirmed nor valid until you receive a confirmation from us through the system. After putting the reservation system through its paces for the new several weeks, we will officially announce when it is ready to handle any and all your reservation needs. Stay tuned for further details. MY FAVORITE THING TO MAKE FOR DINNER IS A RESERVATION! No Replies to "Online Reservations in Beta Testing"